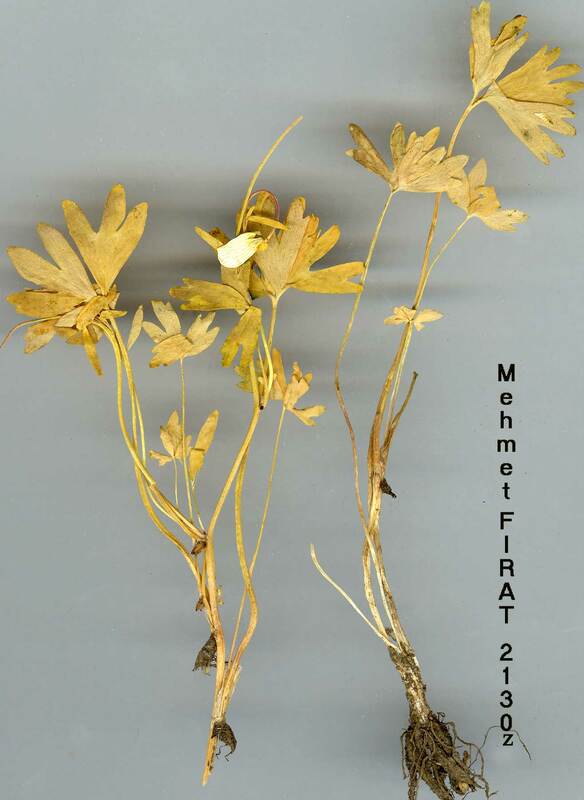 R. munzurensis S. Erik & Yildirimli in Notes R.B.G. Edinb. 40:511, t. lA, B (1983). Erect, nearly glabrous perennial, 14-25 cm. Roots dimorphic, fusiform or cylindrical, 10-14 mm; fibrous roots fusiform, simple; neck sericeous-pilose. Stem 1-3-flowered, sparsely pilose above, glabrous below. Radical leaves with 5-15 cm petioles, glabrous, shortly vaginate at base; lamina palmately tripartite, glabrous, 2.7-5.4x2-3.5 cm, middle segment cuneate, trilobed to 1/5-1/3, lateral segments bipartite to 2/3-3/4, lobes oblong or oblong-ovate, subacute. 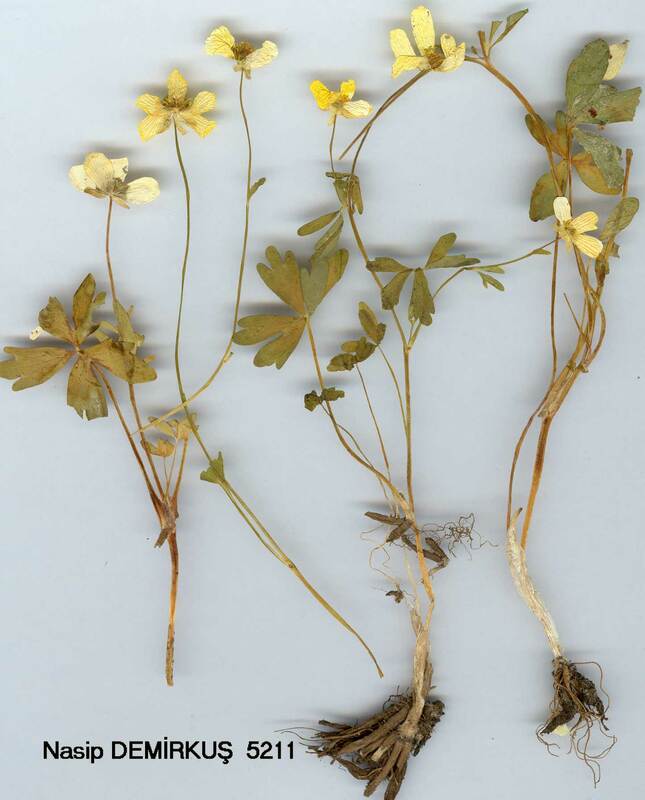 Cauline leaves 1-4; lower ones distinctly petiolate, trisect, middle ones bi- or tripartite, upper ones linear-lanceolate. Sepals 5, patent, ovate or oblong-ovate, 3-4 mm, glabrous, yellowish-green. Petals flavous, oblong-ovate, 7-9 x 4-5 mm. Anthers 1 mm. Fruiting head globose, 5x5 mm. Achenes 25-30, strongly compressed, ovate or orbicular-ovate, glabrous, 1.5x2 mm; beak 0.5 mm, winged, broadly acute, slightly hooked. Fl. 5. Alt. 1300-1500 m.
Type: Turkey B7 Tunceli: district Ovacik, Munzur Dağlari, Karagöl Valley, 1300-1500 m, 6 v 1979, S. Yildirimli [sphalm. Yiödirimli] 1379 (holo. HUB). Endemic. Ir.-Tur. element. Allied to R. cadmicus Boiss. [1:182] (incl. var. cyprius (Boiss.) Vierh.) but differing in having strongly flattened, smooth, ovate to orbicular achenes (not keeled, punctulate and semiorbicular), with winged, broadly acute, slightly hooked beaks.